I’m usually stuffing my face with turkey and mashed potatoes, then watching football while I lie on the couch in a food coma during Thanksgiving, but this year I had the pleasure of experiencing a bit of Portuguese culture over the extended break. And what an interesting and thought-provoking culture it is! The city of Lisbon is riddled with artists and storytellers, all sharing the tragic memories of their past and warning of future catastrophes we can all see slowly occurring right before our eyes. A cry to save the ocean was loud and clear at the Museum of Art, Architecture, & Technology (MAAT). As attendees to MAAT enter the breathtaking, futuristic building, the installation that immediately grabs their undivided attention is titled “Over Flow,” a work created by Japanese artist Tadashi Kawamata. Most spectators’ initial thought is undoubtedly “Why is there a pile of garbage in the art museum?” But as those onlookers continue to gaze upon the installation, they start to recognize its intricate placement and repetitive nuances. Rounding the corner, down the ramp, beneath the net of garbage, the shadows create an underwater-like environment; sunken boats rest on the lower level, below a net of rubbish and unacceptable truth. One immediately realizes the powerful message behind the work. Kawamata worked in collaboration for over a year with a large network of local organizations and volunteers, gathering trash from around the beaches of Lisbon and assembling the piece of art square by square in a strategically thought-out pattern, to help create this awe-inspiring, truly immersive installation. “Over Flow” raises awareness to an ongoing problem, which could result in catastrophe. 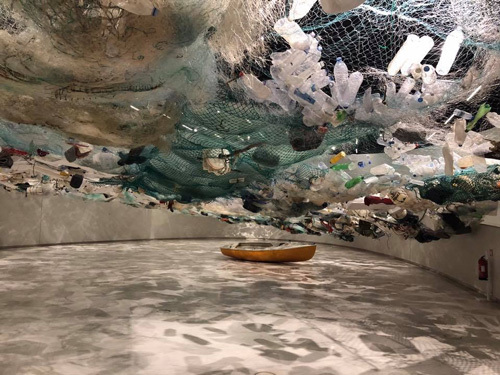 The only thing I could think while standing engulfed in the artist-created seascape of garbage was “We can do better; we have to do better.” I think Kawamata accomplished his mission.